Figure 5.11 The malate—aspartate shuttle for transfer of reducing equivalents from the cytosol into the mitochondrion. mitochondrial inner membrane so undergoes transamination to aspartate (section 9.3.1.2), with glutamate acting as amino donor, yielding a-ketoglutarate. a-Ketoglutarate then leaves the mitochondria using an antiporter (section 3.2.2) which transports malate inwards. 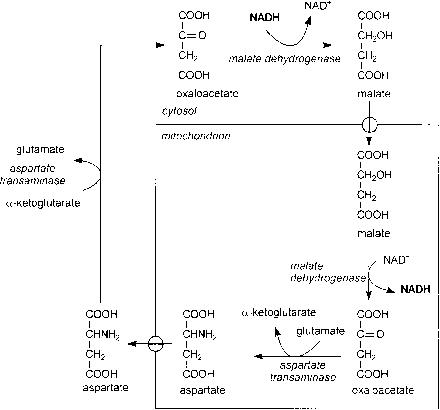 Aspartate leaves the mitochondria in exchange for glutamate entering; in the cytosol the reverse transamination reaction occurs, forming oxaloacetate (for reduction to malate) from aspartate, and glutamate (for transport back into the mitochondria) from a-ketoglutarate. The glycerophosphate shuttle (Figure 5.12) involves reduction of dihydroxyacetone phosphate to glycerol 3-phosphate in the cytosol (with oxidation of NADH to NAD+) and oxidation of glycerol 3-phosphate to dihydroxyacetone phosphate inside the mitochondrion. Dihydroxyacetone phosphate and glycerol 3-phosphate are transported in opposite directions by an antiporter in the mitochondrial membrane. Figure 5.12 The glycerophosphate shuttle for transfer of reducing equivalents from the cytosol into the mitochondrion. dihydroxyacetone phosphate to glycerol 3-phosphate, but the mitochondrial enzyme uses FAD to reduce glycerol 3-phosphate to dihydroxyacetone phosphate. This means that when this shuttle is used there is a yield of ~2 X ATP rather than ~3 X ATP as would be expected from reoxidation of NADH. The malate—aspartate shuttle is sensitive to the NADH/NAD+ ratios in the cytosol and mitochondria, and cannot operate if the mitochondrial NADH/NAD+ ratio is higher than that in the cytosol. However, because it does not use NAD+ in the mitochondrion, the glycerophosphate shuttle can operate even when the mitochondrial NADH/NAD + ratio is higher than that in the cytosol. The glycerophosphate shuttle is important in muscle in which there is a very high rate of glycolysis (especially insect flight muscle); the malate—aspartate shuttle is especially important in heart and liver. In red blood cells, which lack mitochondria, reoxidation of NADH formed in glycolysis cannot be by way of the substrate shuttles discussed above (section 5.4.1.1) and the electron transport chain. 3 mol of ATP if the source is muscle glycogen), NADH is oxidized to NAD+ by the reduction of pyruvate to lactate, catalysed by lactate dehydrogenase (Figure 5.13). 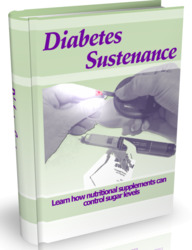 The resultant lactate is exported from the muscle and red blood cells and taken up by the liver, where it is used for the resynthesis of glucose. As shown on the right of Figure 5.13, synthesis of glucose from lactate is an ATP- (and GTP-) requiring process. The oxygen debt after strenuous physical activity is due to an increased rate of energy-yielding metabolism to provide the ATP and GTP that are required for gluconeogenesis from lactate. Although most of the lactate will be used for gluconeogenesis, a proportion will have to undergo oxidation to CO2 in order to provide the ATP and GTP required for gluconeogenesis (see Problem 5.1). Lactate may also be taken up by other tissues in which oxygen availability is not a limiting factor, such as the heart. Here it is oxidized to pyruvate, and the resultant NADH is oxidized in the mitochondrial electron transport chain, yielding 3 X ATP The pyruvate is then a substrate for complete oxidation to carbon dioxide and water, as discussed below (section 5.4.3). 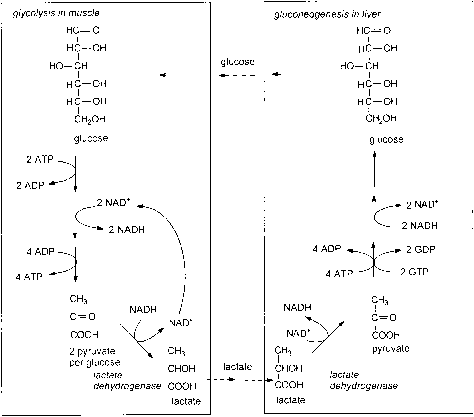 Figure 5.13 The Cori cycle — anaerobic glycolysis in muscle and gluconeogenesis in the liver. metabolism, so that much of the energy-yielding metabolism in the tumour is anaerobic. Lactate produced by anaerobic glycolysis in tumours is exported to the liver for gluconeogenesis; as discussed in section 8.4, this increased cycling of glucose between anaerobic glycolysis in the tumour and gluconeogenesis in the liver may account for much of the weight loss (cachexia) that is seen in patients with advanced cancer. Reduction to lactate, as occurs in human muscle. This is the pathway in lactic acid bacteria, which are responsible for the fermentation of lactose in milk to form yoghurt and cheese, and also for the gastrointestinal discomfort after consumption of lactose in people who lack intestinal lactase (section 4.2.2.2). Decarboxylation and reduction to ethanol. This is the pathway of fermentation in yeast, which is exploited to produce alcoholic beverages. Human gastrointestinal bacteria normally produce lactate rather than ethanol, although there have been reports of people with a high intestinal population of yeasts that do produce significant amounts of ethanol after consumption of resistant starch (section 4.2.2.1). Is NADH/NAD ratio higher in cytosol than mitochondria? Why nadh glycolysis cannot enter mitochondria? How does nadh move to mitochondria? How NADH formed during glycolysis is transported into the mitochondria.? How energy in nadh converted into atp into mitochondria? 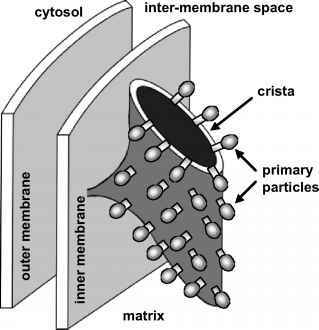 How nadh enters the mitochondrion? What get transferred to NADH during glycolysis? How do the products of glycolysis get inside the mitochondrial matrix? Does nadh enter the mitochondrion? Which transports more cytosolic nadh into the mitochondria? Does NADH2 from glycolosis enters the mithocondria? How is nadh moved into the mitochondria? What glycolysis product is transported into the mitochondria? How does NADH transfer from cycto to mitchondria? What comes first in glycolosis nad or nadh? What does nadh react with in order to transport its electrons into mitochondria?